A couple of years ago I posted about learning to drive a tractor. While I’ve continued to have my sessions with the tractor every 4-6 weeks during the spring and summer, my tractor-driving skills haven’t really improved much. OK, maybe a little, but I still don’t like slopes – and what I call a slope, from my perch up on the seat, probably would just be called uneven ground by someone used to being on a tractor. And this summer, I’ve had to use a bush hog instead of the finish mower deck, because the belt broke on the finish mower early on this spring; I got another and it promptly broke too. We haven’t replaced the belt yet, so we’ve been using the bush hog the past couple of months. 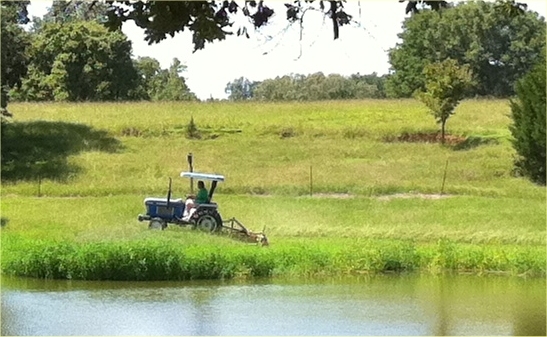 I don’t like using the bush hog – it doesn’t cut as neatly, and the tractor doesn’t drive as easily with it back there. And yesterday I came up with yet another reason to dislike the bush hog. I ran over a couple of fresh cowpies, and discovered that somehow, a bush hog has the ability to hurl pieces of a cowpie directly forwards from underneath the deck. Directly forward, onto the person sitting on the tractor seat. I looked back at the bush hog, and for the life of me I can’t figure out how that happened, but it scored two direct hots, one on my calf and one on the back of my neck. And I said, these were fresh. Very, very fresh. Needless to say, I avoided the ensuing cowpies. Lesson learned. I miss that finish mower.